Aeon BU4455 Swivel TV Wall Mount. 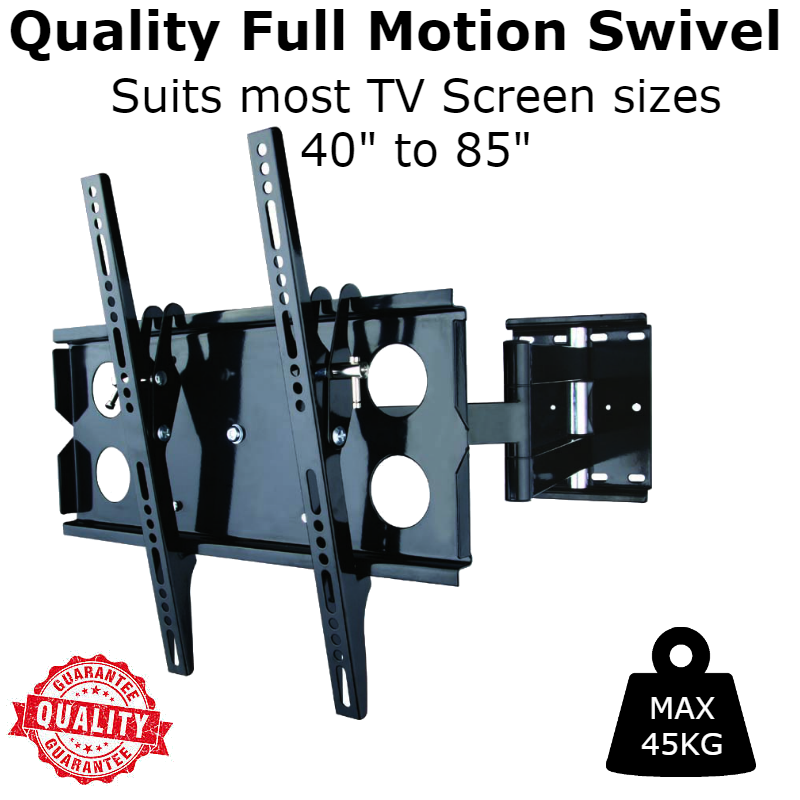 Fits most of 32-70″ LCD/LED/Plasma TVs on the market (even up to some 85″ inch) up to VESA 400×400 and 45Kg (Fits VESA 400X400, 400X300, 400X200, 300X300, 300X200, 200X200, 200X100, 200X150, 100X100, 75X75mm). Please check VESA (mounting hole pattern behind the TV), stud spacing, possible blocked cable/input, and TV weight to determine whether this TV wall mount fits your TV and the installation application. Tilt, Swivel, Articulate, Extend, Collapse with this universal TV wall mounting bracket. Full motion capability makes it ideal for corner installation, over a fireplace, inside a TV center. Swivel left or right 45 degrees. Heavy-Duty design with 45Kg rated capacity. Dual arm design prevents sagging that might be visible on lower weight rated and single arm mounts. Single Stud or Masonry Mounting.